This week, local media ran two news stories about Representative Carolyn Dykema’s efforts on our town’s behalf. 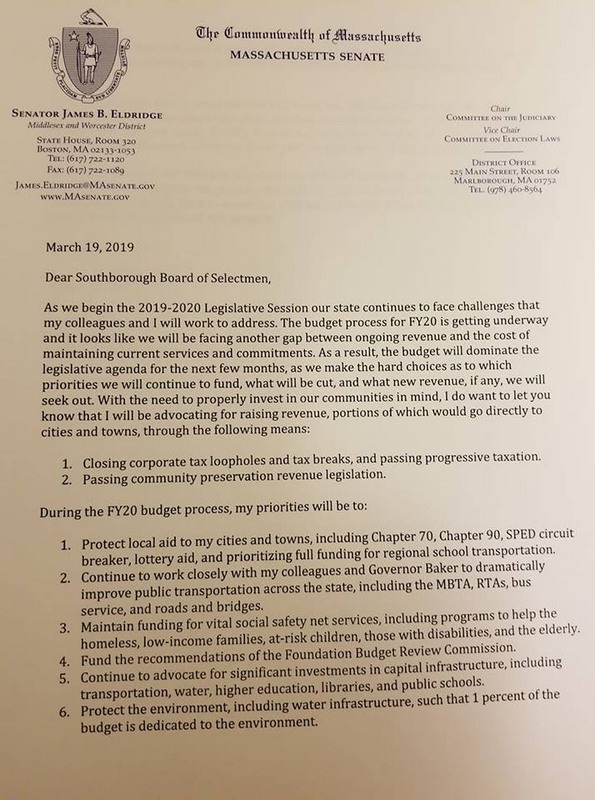 Between those, the coffee hours she posted, and a recent update she gave to Southborough selectmen alongside Senator Jamie Eldridge, it’s time for a roundup. At the March 19th BOS meeting, both legislators covered their efforts and priorities over the past year. Scroll down for some of the highlights along with more information that has come out since. At the March meeting, Rep. Dykema acknowledged that a lot of residents rely on the commuter rail and they (and their employers) don’t appreciate it when they run late. She said was organizing a meeting with town officials and MBTA reps to talk about needed work at the Southborough Station. The Representative told selectmen that she’d already raised cleanliness issues. She said the MBTA had put in some sidewalk improvements and fixed crumbling stairways and drainage. She followed that there’s still more they should be doing. Last Wednesday, Selectman Brian Shea, Public Works Superintendent Karen Galligan, and Town Administrator Mark Purple were scheduled to attend an MBTA sit down at the State House. The following day, Dykema and Rep Alice Peisch submitted a memo to the Lt. Governor on the commuter rail needs. My hope is that this is a road map that will allow us to really focus on those areas we’ve been hearing about from constituents. In the March BOS Meeting, Dykema pointed out the importance of increasing the number of trains to boost economic development. She said “empty buildings” are impacted by employers’ needs to attract millenials who want to live in urban areas and not drive cars. Increasing accessibility for reverse commuters would help. In March, Selectwoman Bonnie Phaneuf asked about the process for MassDot notifying the Town or abutters about tree trimming. Dykema said that she presumed that if its on their right of way they don’t need to give notice. But she acknowledged it would be a nice courtesy if they would. The letter explained that the action took even town officials by surprise who “did not feel they had adequate information to be able to respond” to residents’ complaints and questions. She asked the agency to clarify its process for notifying towns and to make sure that it notifies Southborough in advance of any future “tree trimming”. You can read the letter here. At the March meeting, Phaneuf referred trees taken down from both sides of the pike near a 55+ development that had been there since the 80s, plus some schools. Chair Lisa Braccio said she had also gotten calls about the mature trees that were taken down in the middle of the night. In March, Braccio asked Senator Eldridge questions about a Capital Bonding Bill that listed $25M “for the acquisition of land and construction of a new public safety building in the town of Ashland”. (It appears to be among 300 projects listed an the Act approved last June.) The State Senator said that he didn’t believe any of the “earmarks” had been released. Purple pointed out that the Town is moving forward as if that money is real. He wanted clarity for the public looking “over the short fence betweeen here and Ashland” and questioning the parity. Dykema said that it is always challenging working with bond bills. She said they had looked into it and couldn’t find that any significant funds for a public safety building project were ever successfully released through a capital bond bill. She reminded that with the 5 year bills, any funds released may not be for 5 years. She said she didn’t know how you could plan for a facility “with that level of uncertainty”. Eldridge followed that while schools and libraries are often co-funded by the state, typically there isn’t funding for public safety and senior centers. He said that a bill has been filed to do that. The downside is that it would likely require raising state taxes to do it. then you can stabilize property taxes and provide more. . . education aid, or restore cuts to the environment or even better fund something like the Community Preservation Act. Later this week, the Representative is holding her quarterly in-town coffee hour. You can drop in to her to talk about issues or just chat. That’s this Friday, April 12th from 8:00 – 9:00 am at Red Barn Coffee (Rt 9 East), 20 Turnpike Road. If you scroll back up to the video, you’ll see topics discussed by legislators included education funding, increasing registry of deeds fees to provide more funding for matches to the Community Preservation Act, the opioid crisis, mental health coverage and more. Thank you for posting about the Ashland parity bond bill question and for Ms. Braccio asking the question. Just the kind of representation I want out of my selectmen. If what Senator Eldridge and Rep Dykema say is true, it looks like the residents of Ashland are getting swindled. Get the project moving under this pretense and foot the taxpayers with the bill later. If it turns out Eldridge and Dykema were just deflecting, and that money does get released, I hope our selectmen push them again. Either way, not very good representation from them, if bills like this are just aspirational, they should be making sure the residents of Ashland understand this. Politicians like Eldridge will not admit that half of workers do not pay any income taxes. Half. Nothing. The top 50% pay all the income taxes. The top 10% pay 70% of all taxes collected and the top 1% pay nearly half of all the taxes. The tippy tops really do pay much much more. Senator Eldridge has never proposed anything to make the state budget more efficient. Quite the opposite, more of the peoples money for the state to spend is never enough. As far as parity with other towns generally a municipality is on their own for fire and police stations though that is not always the case. If the average person saw the goodies and questionable projects included in the every budget since the mid 1990s at least they might have a different perspective on tax policy. That’s a really good idea. Are you going to ask the BOS? I’ve often wondered what the procedure is for asking the BOS something. How does a resident get their concern on the agenda? Does anyone know the process? You can email selectmenoffice@southboroughma.com with questions, concerns, and requests. You can also try contacting individual members. Since the agenda is generally the discretion of the chair, I’d start there for asking about adding an item to the agenda. Currently, the chair is Lisa Bracci and her official email address is lbraccio@southboroughma.com. I hear you (no pun intended)! I’ve been calling the state police to address the issue with large trucks and their straight pipe (no baffles) exhaust systems, blasting up & down 495 at all hours of both the day and night. I’ve lost count of how many times I’ve been awakened at midnight, and any hour til sunrise by these vehicles. Roaring on the uphill sections, then the Jake brake on the downhill sections. We have the same issue on route 9 in Southborough with the hills and stoplights. Again, these irresponsible truck owners spew their noise for at least a mile in all directions as they go roaring through Southborough. Chief Paulhus – are you listening??? re: some of the comments above, no I’m not personally getting involved with the BOS on this one, been there and done that years ago on other issues, and the outcome was useless, I suggest someone with the time and energy work with the BOS on the noise issues from the Ma. Pike I have neither. As far as the S PD goes they can’t do anything about it . It’s a state highway, and it’s not a public safety issue. Eldridge is just singing from the same song sheet as our US Senators and/or all the current Democratic hopefuls for president – No news here. As usual increase taxes on the wealthy while wealthy is never defined. He must be running to be on Warren’s campaign committee. Perfect fit from what I read. Was curious about your comment so I googled Elizabeth Warren tax policy and got this https://elizabethwarren.com/ultra-millionaire-tax/ as top hit. There’s a lot more detail following that. Not necessarily a Warren supporter… but your claim seemed fishy and partisan. Partisan – guilty as charged with any politician trying to raise taxes. Send the information to Eldridge – at least he’ll have a definition of wealthy which I’m certain will never change………until the next election. See if this statement is “fishy”: Democrats have never met a tax they did not like. Applies to many Republicans – did my best to make it a little less partisan. I suppose partisan is fine. Just keep it informed and you might actually convince someone of something someday. We already have a wealth tax called the estate tax with rates up to a whopping 40%. Wealthy estates pay 40% of the value of their estates. Warren has very poor poll numbers and seems to be just throwing ideas out their to see what sticks which doesn’t seem like much. So back to the wealth tax and a few reasons it is not very efficient. #1 administration. Most wealth is very difficult to value so appraisals would have to be done. Every single year. So the IRS would have to hire legions of appraisers. #2. efficiency. Most wealth is not liquid. So for example a person that owns an manufacturing plan worth $50 million. Do they sell part of it every year to pay this tax ? do they borrow against it? and of course the biggest reason. Equity. The top 1% already pay a hugely disproportionate share of income tax and half taxpayers get of scot free. .
“The tax, which can be as high as 40 percent, is only liable when the assets of an estate are more than $5.49 million (nearly $11 million for a couple), so only a small number of the very wealthiest multimillionaires pay it. Glad you are looking out for those inheriting 5.5M+. They need more advocates. Not sure if you have ever paid taxes, but efficiency does not appear to be anyone’s goal. It sure would be interesting in knowing who you are, you seem to have some very outdated ideas about the world. Quick note on estate taxes… It’s only taxed on value above $11.8 million dollars, and for a couple doing a few simple things with inheritance, that essentially means a couple can leave over $23 million dollars tax free. It’s estimated that less than 0.1% of estates will pay any estate tax at all.